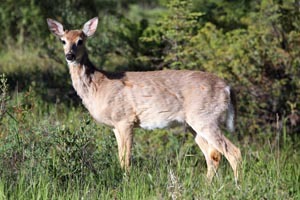 A white-tailed deer beside Highway 93. For most visitors Kootenay National Park wildlife viewing is concentrated along Highway 93, with dawn and dusk the best times to see larger mammals. With over 5,000 vehicles daily travelling the route during summer, most wildlife tends to move away from the highway during the middle of the day. The animals you’re most likely to see from the highway are white-tailed deer, which are generally very flighty when feeding along the side of the highway. Also present in the Kootenay and Vermilion River Valleys are mule deer, moose, black bears, and elk. Mountain goats generally stay at high elevations, feeding in alpine meadows throughout summer, but we have seen them down beside the highway near the Vermilion River. A wolf beside the Vermilion River. Exact grizzly bears numbers within the park are unknown, but there are probably only 30 or 40, most of which range throughout the remote backcountry. Occasionally they are sighted in spring high on avalanche slopes near Kindersley Pass and beside the highway at Vermilion Pass. Bighorn sheep can be seen at mineral licks along Highway 93, but are most common in the vicinity of the mineral pools at Radium Hot Springs. They spend time on both sides of Sinclair Canyon, including in the village of Radium Hot Springs itself. Although no wolf packs call the park home, lone wolves are occasionally spotted along Highway 93 between Kootenay and Vermilion Crossings. 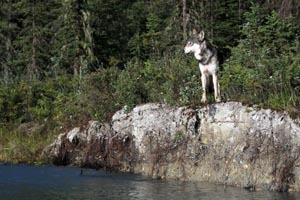 The wolf pictured below was photographed beside the Vermilion River. Even if you’re not interested in photography, the Canadian Rockies Wildlife Photography eBook, by renowned wildlife photographer Wayne Lynch, is a great resource for searching out local wildlife. It includes all the very best places to view wildlife in Kootenay National Park. A wildlife crossing underpass along Highway 93. 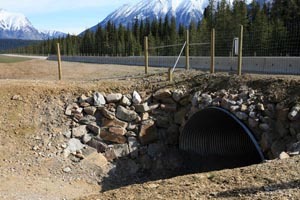 In 2013, Parks Canada completed a wildlife crossing project near the Dolly Varden Picnic Area, along a stretch of highway that traditionally saw around 50 large mammals killed by vehicles annually. Deer were the most common victims, but many other species had been hit, including lynx and wolverines. The construction included a 4.7-kilometre stretch of fence along both sides of the highway, as well as three underpasses. The initial fencing project proofed to be a success in reducing wildlife mortality, and was expanded to include a section of highway further east in 2015.